It was a fourth loss for the Mumbai Indians on the trot, as the Super Kings registered their third consecutive win, beating the hosts by a margin if 6 wickets. It was a Pollard show earlier in the match, which raised the sinking expectations of a maiden Mumbai Indian win this season, but the Smith and McCullum display later snatched the match away from the Mumbai franchise. 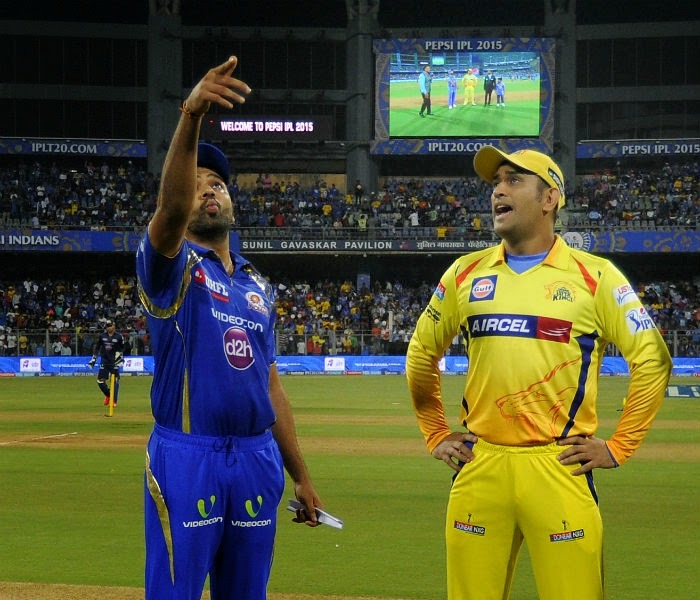 Mumbai Indians won the toss and opted to bat first in front of a defeaning and jam packed home crowd. They had a nightmarish start which might have sent a chill down the spine of the Mumbai supporters as their first wicket fell of in the very first over of the innings in the form of Parthiv Patel who returned for a duck after being given leg before wicket off a ball of Ashish Nehra. 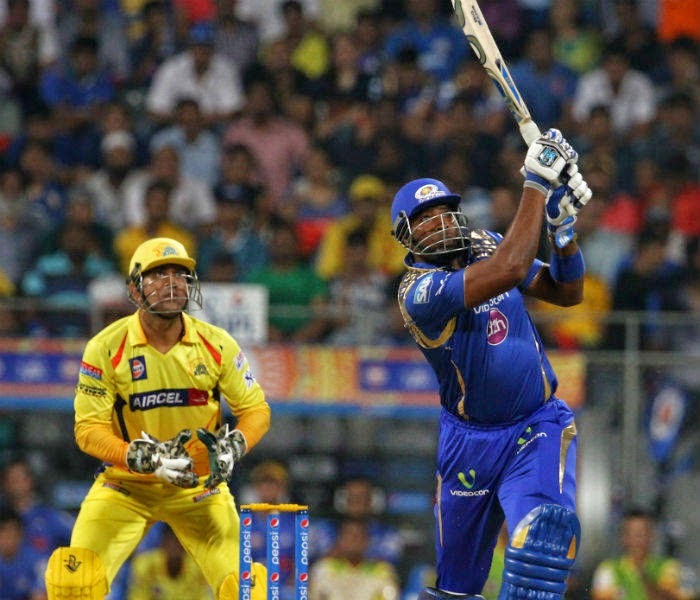 This was not only it, as the Super Kings blew away two more scalps of the Mumbai Indians as the man in form Corey Anderson departed and was followed up by Lendl Simmons as they were reeling at 12-3 in just 4 overs. Harbhajan Singh along with the skipper Rohit Sharma at the other end, seemed to provide some stability by clearing the boundary but soon was removed by Mohit Sharma in the 10th over for 24 runs. Then in came Pollard, who had blasted and hit great shots in one of his recent innings and this time too he had something similar to offer. With Rohit Sharma to accompany him on the other hand, both of them took the bowlers to the cleaners. Where a score around 120 seemed to be out of reach for the Mumbai team, the duo put up a 75 run stand providing a much needed acceleration to their team. Rohit Sharma proved his class yet again by scoring 50 in just 30 balls when the team required him. However soon he hit a ball off Nehra into Bravo's hands in the 15th over on a stable 132-5. Pollard made a display of sheer excellence and proved himself as a game changer yet again by thrashing 64 of merely 30 balls. The last over of the innings, witnessed quite decent bowling by DJ Bravo who picked up two wickets in succession as the Mumbai Indians ended up with 183 runs on the board, which initially was beyond imagination. Ashish Nehra was the pick of the bowlers grabbing 3 wickets and just giving away only 23 runs. On the other hand others proved out to be quite expensive with Sharma, Jadeja and Ashwin giving away more than ten an over. The Mumbai Indians might have turned momentum their way but the Super Kings put up a show in the second innings, for which they are best known. 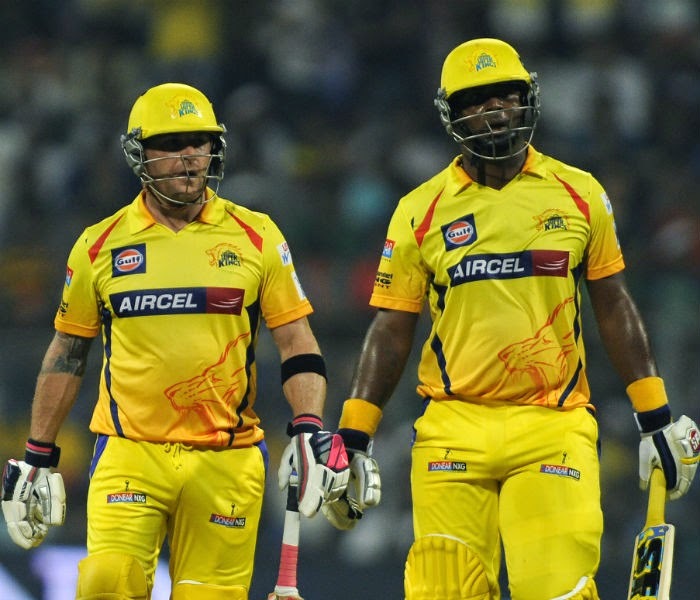 They were upon the home team from the word go, as the openers Brendon McCullum and Smith provided a dream start to the Super Kings. They hammered the ball which landed outside the boundary line more often than not. Almost all the bowlers were brought upon by the Mumbai Indians thinking that someone would provide the needed breakthrough but none of them had any answers for the belligerent McCullum and Smith. Speeding up the run rate in the speed of a bullet train, the openers took the score to 100 runs in merely 6.5 overs. It was nothing but an exquisite exibhition of some colossal a d mind boggling shots as the Super Kings proved their class yet again. After that it was easy sailing for Chennai. However, in the 8th over of spinner Harbhajan Singh, first McCullum departed scoring 46 off 20 balls and two balls later it was Smith who had to return scoring a swashbuckling 62 off 30 balls. The wickets came too late as the carnage was already done. All that was required a perfect wrap up to the beautifully set up platform for a clinical victory and this was what exactly happened. Although they lost DuPlessis and Dhoni both to Kieron Pollard, Suresh Raina did the job remaining unbeaten on 43 of 29 balls. Dwayne Bravi did the ultimate task by hitting a six, as his team clinched a comfortable win. Ashish Nehra was adjudged the Man of the Match for his three wickets haul. Man of the Match, Ashish Nehra is flanked by team mates after a wicket. Image: Cricket NDTV. The Mumbai Indians will need to go back and start sorting out and filling up their loopholes in both the batting and bowling department. As for the Chennai Super Kings, they will be oozing with confidence as they have announced a thumping arrival in this tournament promising their fans a great show ahead.